Tweet Last week I was invited to a friend's Art Gallery opening at Publika Mont Kiara. The owner is a passionate art collector who has been buying art from struggling artists in Indonesia. The gallery called Artemis Art is full of affordable original paintings, which also had some other Asian artists. After attending the opening cocktail, I was inspired to pick up my brush again. Yesterday, while little Alex was at school, I finished a 40"x50" painting . I was inspired to try something totally different from my usual abstracts and flower series. It was scary because I rub the risk of "failing" in my own attempt... But life is too short! Worst case I would spoil a canvas. After 5 hours of painting, I finished my first teddy bear painting. It turned out okay, despite my doubts. After my daughter woke up from her nap, she was happy to see it! And even attempted to shake its hand, gave it a kiss and a hug. Wow, what a reward! The day after, she realised that it is in fact her teddy bear which we bought long ago from France. 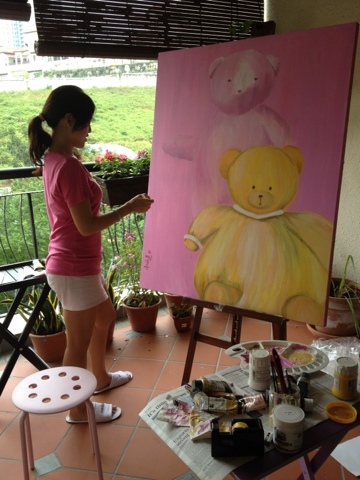 To people who want to try painting, I believe Artemis Art will be organising a painting workshop for adults and kids. Just contact U.C.Loh at +6012-3732188 Artemis Art. woooooo, sounds interesting. How much is the cost of 40" x 50" painting? Hi Cammy thanks for dropping by! 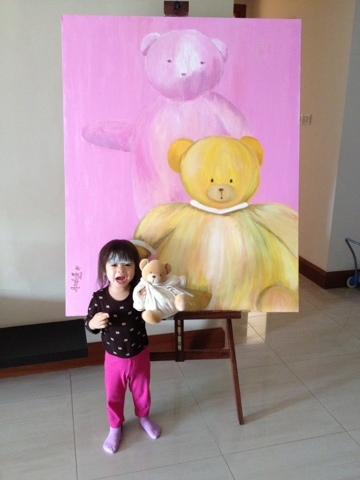 Paintings that size will vary from rm 1200-2000 depending On the design ... If u are interested u can email me anabelle.co@hotmail.com that size is big enough to be centerpiece for rooms, living room or dining room.